The best Dutch – Spanish translation agency. Dutch-Spanish translators who are experts in their areas. Competitive prices and a fast price quote by e-mail. 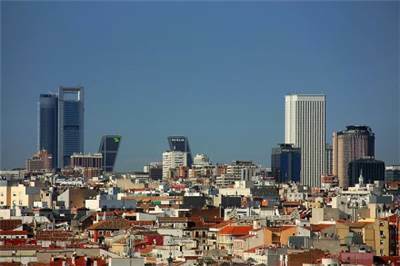 View of Madrid (Spain), from Edificio Carrión (a downtown building) to the north. At the left, CTBA buildings. At the right, AZCA business park, and in it, Torre Picasso (white skyscraper). Budgettranslations guarantees high-quality Dutch to Spanish translations with an excellent price-quality ratio with efficient and professional service. The importance of Spanish as a global language is increasing, both business-wise and in a cultural context. It is expected that, within the next twenty years there will be more Spanish-speaking Americans than English-speaking ones. Due to this development, Budgettranslations has been receiving more and more Dutch-Spanish translation jobs from companies and government organizations. Budgettranslations only employs Spanish native speakers who have the experience necessary to translate from Dutch into Spanish using a natural style and the right terminology. Our processes focus on providing you with a perfect Dutch to Spanish translation, and on giving you an idea of the costs and delivery time as quickly as possible. Simply e-mail us your document and we will send you a clear and detailed quote right away. Customers often wish to receive their Dutch to Spanish translations rather quickly. We offer three convenient delivery time options to meet your deadline: urgent, standard and not urgent. This gives you a choice of three rates. It goes without saying that we guarantee the quality of your Dutch to Spanish translation for all three options. Please be sure to take into consideration that a sworn Dutch to Spanish translation will often take more time to complete, especially if the sworn translation has to be certified (with an apostille for example). Would you like to request a quote right away? Simply fill in the quote request form on the right. You can also e-mail us your text. Either way, you will receive a specified quote for your Dutch to Spanish translation right away.